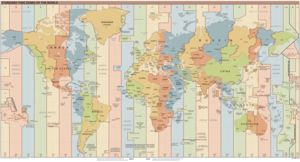 DST is not observed in this time zone. South Korea has one time zone, Korea Standard Time (UTC+09:00), which is abbreviated KST. South Korea does not currently observe daylight saving time, but experimented with it during the 1988 Summer Olympics in Seoul. In 1434, inventor Jang Yeong-sil developed Korea's first automatic water clock, which King Sejong adapted as Korea's standard timekeeper. It is likely that Koreans used water clocks to keep time prior to this invention, but no concrete records of them exist. In 1437, Jang Yeong-sil, with Jeong Cho, created a bowl-shaped sundial called the angbu ilgu (Hangul: 앙부일구), which King Sejong had placed in public so anyone could use it. In 1908, the Korean Empire adopted a standard time that was ​8 1⁄2 hours ahead of UTC, UTC+08:30. In 1912, during the Japanese occupation of Korea, the Governor-General of Korea changed standard time to UTC+09:00 to align with Japan Standard Time. However, in 1954, the South Korean government under President Syngman Rhee reverted the standard time to UTC+08:30. Then in 1961, under the military government of President Park Chung-hee, the standard time was changed back to UTC+09:00 once again. In order to accommodate American television viewers, South Korea observed daylight saving time when Seoul hosted the 1988 Summer Olympics. The one-hour time change meant that many daytime events could be broadcast live from South Korea when it was prime time on the U.S. east coast. North Korea also uses Korea Standard Time. From August 2015 to May 2018, North Korea changed its time zone to UTC+08:30, a time zone known as Pyongyang Standard Time, but the change was reverted to promote Korean unity. The IANA time zone database contains one zone for South Korea in the file zone.tab, named Asia/Seoul. ^ "표준시" [Standard Time]. Doosan Encyclopedia (in Korean). Retrieved 2018-03-03. ^ "KST". Geospatial Information System Glossary (in Korean). Retrieved 2018-03-03. ^ "Current Local Time in South Korea". timeanddate.com. ^ a b Chad, Norman (1987-01-30). "Live From Seoul, 1988 Olympics Now Are Ready For Prime Time". Washington Post. ISSN 0190-8286. Retrieved 2018-03-03. ^ Chappell, Bill (2017-03-29). "The Olympics' TV Time-Delay Is Going Away, NBC Says". National Public Radio. Retrieved 2018-03-03. ^ Pak, Sŏng-nae (2005). Science and Technology in Korean History: Excursions, Innovations, and Issues. Jain Publishing Company. pp. 96–99. ISBN 0895818388. ^ Park, Changbom (2008). Astronomy: Traditional Korean Science. Ewha Women's University Press. p. 135. ISBN 8973007793. ^ Yu, Jeong-in (2010-08-09). "1961년 표준자오선 동경 135도로 변경" [1961 Standard Meridian Changed to 135 Degrees East]. The Kyunghyang Shinmun. Retrieved 2018-03-03. ^ "North Korea's new time zone to break from 'imperialism'". BBC News. 2015-08-07. Retrieved 2018-03-03. ^ "Turning back the clock: North Korea creates Pyongyang Standard Time". Reuters. 2015-08-07. Retrieved 2018-03-03. ^ Westcott, Ben; Yoonjung, Seo; Watkins, Eli. "North Korea will close main nuclear test site in May, South says". CNN. Retrieved 29 April 2018. ^ "혼란 주던 '30분 시차' 사라진다…서울 표준시로 "통일"" (in Korean). 2018-04-29. Retrieved 2018-04-29. This page was last edited on 1 March 2019, at 08:41 (UTC).